I've cried with laughter so much that I couldn't see the page. The Observer is quoted on the front cover with 'Bryson at his best: laugh-out-loud'. I concur. I'm still laughing. Bill Bryson is one of the funniest writers alive today. His books are usually travel journals, and so is this. Only he's traveled in time instead of space to tell us about his American childhood. The Thunderbolt Kid was once his alter-ego. He mentally vaporized parents, teachers and whoever else tried to thwart his childish dreams. He admits that his superhero tendencies occasionally still manifest in daydreams. When Des Moines gave him the key to the city, officials included The Thunderbolt Kid in his name. You don't have to discern anything in common with him at all. He'll make you feel like you were there; and leave your sides aching from the experience. I've never been to Des Moines. I've never even been to Iowa. I wasn't alive in the fifties. My mother was only born halfway through the decade. I'm female and was never given to fantasies about superheroes. In short, there should be nothing at all with which to identify in Bill Bryson's childhood. Yet this British woman, born in the 1970s, walked with him every step of the way. I gloried in the descriptions of baseball, despite not knowing a thing about the sport. This is the power of his wonderful narrative. And he is funny. I can't reiterate that enough. I tend to read before going to sleep and, as a night owl, that is usually long after the rest of the household have retired. My noise would wake them. 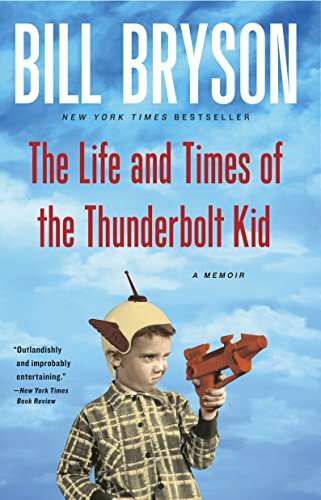 As a result I read most of The Life and Times of the Thunderbolt Kid with my mouth stuffed with a soaking corner of quilt. I was trying to muffle the laughter. I had the giggles so badly, at 4am one morning this week, that I nearly smothered myself with a pillow trying to be silent. You can't help it. 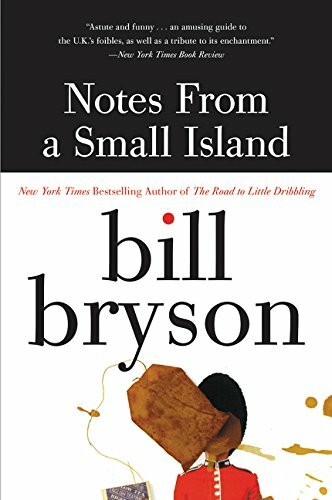 Not with anything that Bill Bryson has ever written, and certainly not with this book. Up against some stiff competition, I honestly think it's the best one he ever wrote. 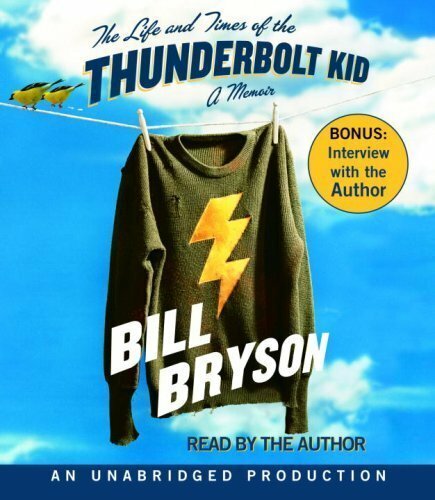 Bill Bryson: Excerpt from The Life and Times of the Thunderbolt Kid Animated! I can only assume that a fan did this. I love it though! It beautifully takes us through the young Billy's superhero qualities. He's the Thunderbolt Kid, all grown up. 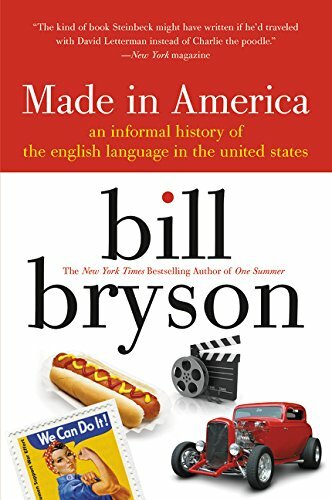 An internationally renowned writer, Bill Bryson was born in the American midwest during the 1950s. A normal Iowan schoolboy (though apparently with secret super powers), he attended school, played with friends, visited relatives and went shopping downtown. Just like every other child in 1950s USA. After college, he traveled the world, wrote about it, then met a nice British woman and settled down in the UK. Eventually though, he did return home. His native Des Moines had changed beyond recognition, but it still felt like home. This memoir is partly a history, remembering what it was like back in the day. As read by Bill Bryson himself. Bill Bryson paints such a vivid picture of postwar America, that I feel like I was there too. I know those people and I walked those streets, even though I live half a world and half a century away. The vibrancy of his words really does make everything come to life, usually in hilarious ways. You can't help knowing the people around him, then caring about them, anticipating what they will do and guffawing with utter abandon, when they actually do it. Yet all of this is set through the eyes of a small boy, slowly growing up. As the chapters progress, you're taken through puberty into college. But the teenage years are dealt with quite quickly. It's the little boy we're concerned with. Young Billy Bryson. The Thunderbolt Kid. The thing that I adore about Bill Bryson's books (other than their humor) is that he can't help himself sharing snippets of facts. Even here, when it's all supposed to be the playful, half-imaginary world of a small, American boy, there is context. We learn daft, little details about department stores in Des Moines, or, more disturbing, terrifying trivia about the Atomic Age. It's never enough to count as a history book, but it helps fix his memories into the broader world. I found myself utterly engrossed while the Bay of Pigs fiasco was playing out. Poor Billy was stood on his back porch, convinced that they were all about to die. Just when you're ready to cry with the pathos, he goes and writes something hilarious and off you go again. And I think I now know all that was ever needful about stripper tents at the Iowa State Fair in the 1950s. 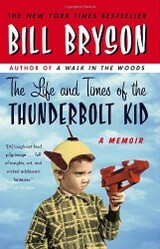 Who Will Like to Read The Thunderbolt Kid? It's difficult to think who wouldn't to be honest! I probably am not at all the target audience and I savored every last syllable! If you want to know what life was like in the middle of the 20th century, in the middle of the decade, in the middle of America, in the middle of Iowa, then this is a memoir for you. If you have a sense of humor, then grab it immediately. Also grab a glass of water and some tissues, and warn everyone around you. Because you are going to be laughing out loud. I don't care how introverted you are. I can usually read in silence too and I just roared aloud at some of the recollections. So yes, prepare for side-splitting, throat aching, eyes watering, mouth hurting, can't stop laughing type hilarity. Those without a sense of humor need not apply. If you enjoy random bits of trivia on whatever catches his narrative eye, then you'll love this. 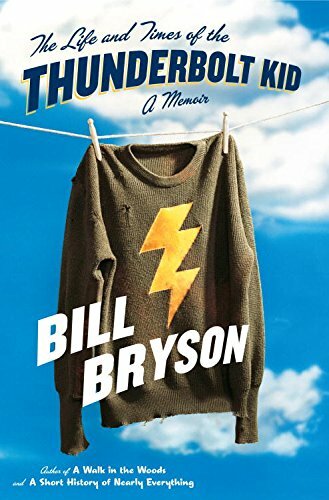 And if you already know and appreciate Bill Bryson's other works, then add this to the top of your wishlist. I honestly think that it's his best yet. I've read all of these (and many more of his works besides) and they're ALL brilliant. These are my favorites though. Can you imagine working in somewhere like Diagon Alley? The shopkeepers of Glastonbury don't need to, they do it every day! Most Titanic books end with the sinking. That's when this one begins. It's the shocking, heart-breaking story of two families left behind. When Chef Keem isn't running Wizzley, he's cooking, as the name might suggest. Anecdotes and recipes abound from his days as a chef in a remote Alaskan lodge. It's one of the most famous Christian pilgrim treks in Europe. Wizzley author Sam knows it well. She walked its ways and lived on it for years. It'll be 'A Walk in the Woods'. I've got it here to read but haven't pulled it out yet. Your recommendation has me nudging it up the pile. Thanks! My sister sent me a copy of Bryson's walk down the Appalachian Trail. Can't remember the title but I loved it! 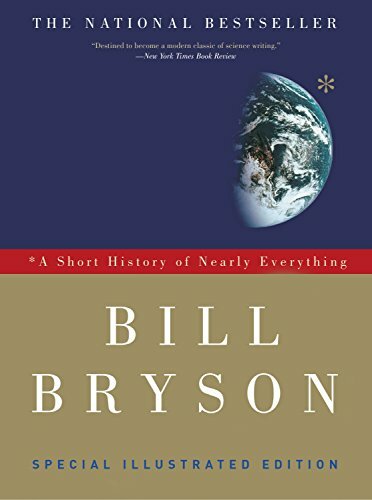 I adore 'A Short History of Nearly Everything'. This isn't about the same sort of things, but it's still Bill Bryson's voice. His own history, rather than the history of all. But yes, I thoroughly recommend it.